This chart shows the copyright page of the 1830 edition of the Book of Mormon. It is of historical interest and is not included in the 1981 edition. 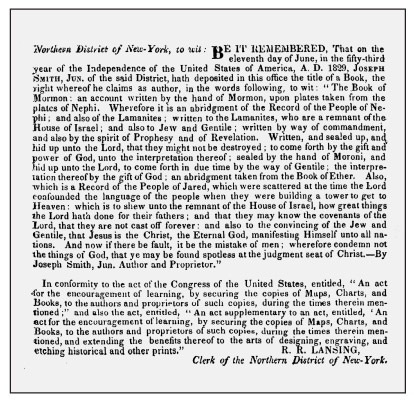 As this photocopy shows, the copyright was secured on 11 June 1829. The copyright application used the language of the title page as the book's description. At the bottom of this page, the text of the federal copyright statute appears, authorizing "authors and proprietors" to secure copyrights for books. To protect the integrity of this sacred scripture, the Prophet Joseph Smith took all available steps to ensure its safety.